Hi, I'd like to show you this page I found on Great American Home Store's website. Online pricing and availability are subject to verification and correction by Great American Home Store and are subject to change. Please contact us to confirm pricing and availability. Sale items may be sold as-is. DELIVERY: Same-day local pickup is available on most in-stock items. Most in-stock items can be delivered within the Memphis, TN market area within 2-5 business days. Contact store to confirm current item availability, schedule a pick up time, and finalize delivery timeframes. The Marquee Power Motion Sofa from Bassett features antique brass nailhead trim and a power headrest option. The power headrest allows you to adjust the upper back cushion for the perfect neck and head support. Both ends recline with the touch of a stylish button that is on the side of the sofa. In 100% Top Grain Cowhide Leather, it has Vinyl on backs and sides. The Marquee has perfectly filled bustle backs, pleated arms and T-cushion fronts. The harp shape of the roll arm further emphasizes it's traditional styling, and double-needle, accent stitching helps add to the Old World feeling. 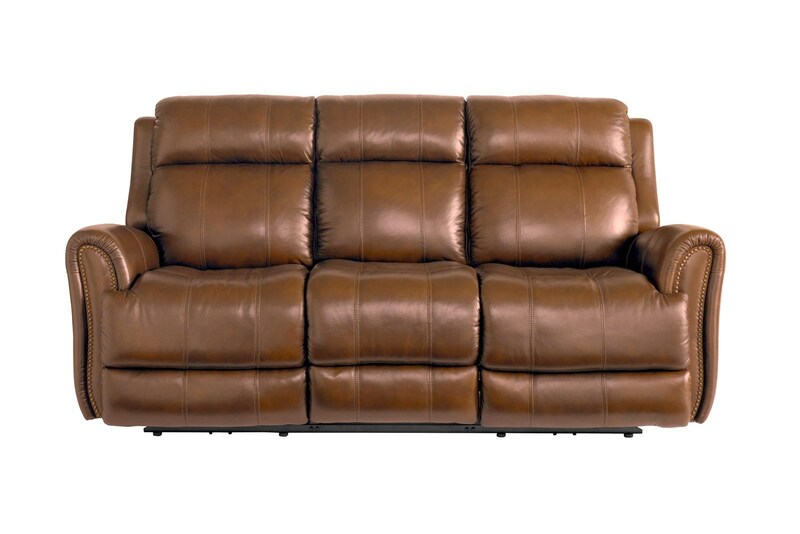 The Marquee Umber Leather Power Reclining Sofa with Power Headrest by Bassett at Great American Home Store in the Memphis, TN, Southaven, MS area. Product availability may vary. Contact us for the most current availability on this product. The Marquee collection is a great option if you are looking for Transitional furniture in the Memphis, TN, Southaven, MS area. Browse other items in the Marquee collection from Great American Home Store in the Memphis, TN, Southaven, MS area. Information Accuracy - We have taken great care to provide you with information on this site that is accurate and useful. Prices and availability of products and services are subject to change without notice. Errors will be corrected when discovered. Great American Home Store reserves the right to retract any stated offer and to correct any errors, inaccuracies or omissions. We ask that you contact us directly or visit our stores to confirm information about pricing, fabrics, colors, finishes, features, dimensions, and availability.